EncryptPad is an application for viewing and editing symmetrically encrypted text. Using a simple and convenient graphical and command line interface, EncryptPad provides a tool for encrypting and decrypting binary files on disk while offering effective measures for protecting information, and it uses the most widely chosen quality file format OpenPGP RFC 4880. Unlike other OpenPGP software which main purpose is asymmetric encryption, the primary focus of EncryptPad is symmetric encryption. Path to a key file can be stored in an encrypted file. If enabled, you do not need to specify the key file every time you open files. Customisable passphrase generator helps create strong random passphrases. Good post, thanks. 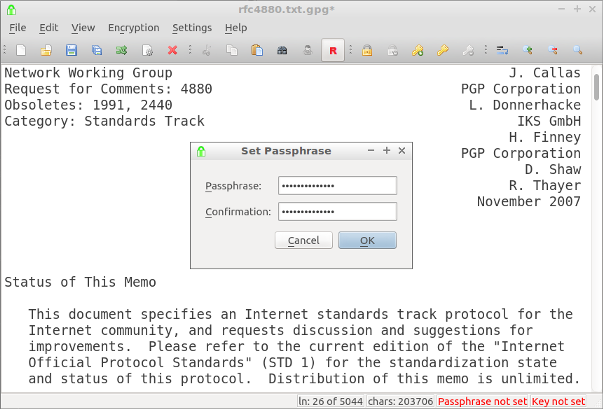 I'm a little confused why the author went with GPG for encryption but didn't include at least the option for public key encryption. A nice replacement for GPG4USB. You acknowledge it's not stealth, but do you know if it's portable or not? You posted this under discussion so I'm not sure where this sits on the spectrum. EncryptPad wrote: Portable binaries are available for Windows and macOS. They can be copied on a memory stick or placed on a network share. I'm don't know much about encryption but thought it was nice it is multi-platform which may be useful to some. EncryptPad was in my review list, thank you for posting about it. However it is portable in a broader sense being cross-platform. Finally I found time to file a request for Portable Mode and I suppose that the developer, Evgeny Pokhilko, responded favourably. If in the feature an option to run EncryptPad in portable mode is implemented I may add it to the database, of course you may do it yourself if you'd like since you are the original reviewer of the program. Also doesn't support ASCII armored text. Since version 0.4.0.3 (Change Log & Release Notes) EncryptPad is portable (GitHub issue, Portable mode). EncryptPad checks the executable directory for a sub-directory called encryptpad_repository. If exists, it is used for key files and settings. The directory .encryptpad in the user's profile is then ignored. The EncryptPad executable and encryptpad_repository can both be copied to a removable media and used on multiple computers. It should be noted that keeping encrypted material with the key files on the same removable media is less secure. Separate them if possible. Thanks to the developer - Evgeny Pokhilko for making it possible to use EncryptPad in portable mode! Please move this thread from Portable Freeware Discussion sub-forum to Portable Freeware Submission sub-forum. As noted by rqqt, it doesn't support ascii-armored text, but that might change in the future. Regardless, this program is way ahead of so many other similar tools we have here on the site. I'll get it added to the database in the days ahead. Thanks smaragdus and lintalist.